Disney is going to be taking its Marvel movies back from Netflix when it launches its own streaming service, and while that supposedly won’t impact Netflix’s originals like Daredevil and Jessica Jones, Netflix is still looking to prove that it doesn’t need Marvel to make a superhero adaptation. That’s where The Umbrella Academy—an adaptation of Gerard Way and Gabriel Bá’s comic series of the same name—comes in. We previously heard that Ellen Page would be appearing in the show, but now Netflix has offered up clear looks at every member of the eponymous superhero team/adopted family along with some images from the show itself. First, the backstory: In the comic, The Umbrella Academy is about a man named Sir Reginald Hargreeves who adopted seven children, who all have superpowers. As kids, he gave them all codenames made them into a superhero team, which kind of turned them into fucked-up adults. The main storyline takes place after Hargreeves—who calls himself The Monocle—has died, prompting his adopted children to reunite. Up above and just below this are a couple of photos of the whole family, including (surprisingly enough), the family’s super-intelligent chimpanzee friend Dr. Pogo. Spaceboy/Luther has super-strength, and in the comic his head is grafted onto the body of an alien gorilla. It’s unclear if that’s the case here, but he does seem to have a bulky jacket in every shot. The Kraken/Diego can hold his breath very well, but other than that he’s basically a Batman-style urban vigilante. The Rumor/Allison can change reality by lying about it, which seems much more powerful than her number would indicate, but whatever. The Séance/Klaus has some telepathic powers and can communicate with dead people. He also doesn’t wear shoes and is fucked-up in a relatively straightforward way. The Boy/Number Five doesn’t have a real name, and as a child he jumped 50 years into the future. It took him 50 more years to figure out how to get back, and when he did, his body completely stopped aging (meaning he’s an old man stuck as an immortal child). The Horror/Ben is dead at the time of the main story, but he had extra-dimensional tentacle powers. Vanya has no powers and is a completely normal person, other than the fact that she likes to play the violin. Yep, that’s all there is to say about her, so don’t bother questioning the fact that the least interesting character is played by the most famous person. 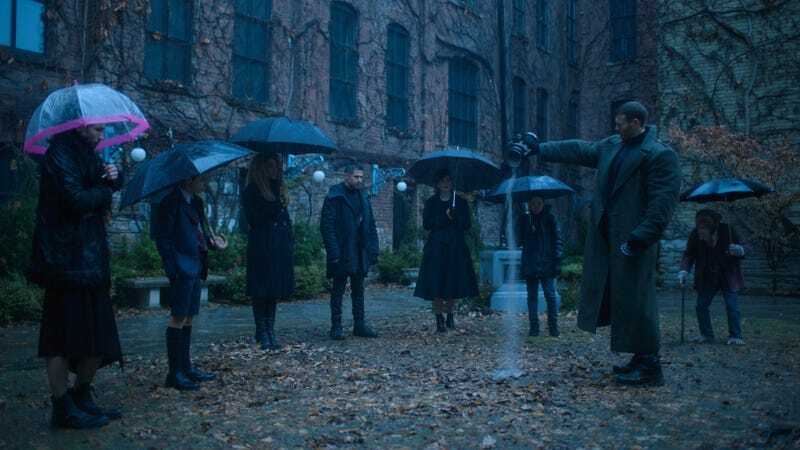 The Umbrella Academy hits Netflix on February 15.